One of my favorite inventive dishes from our trip to Italy was the eel ice cream at Don Alfonso. There it was served with rose-flavored pasta, but I thought it would also work very well with beets. Eel is most easily available here in smoked form, and since I figured that the smokiness would add a nice additional dimension, that is what I used. But fillets of steamed eel could also be used. This eel ice cream is quite easy to make (I am not claiming that it is the same as at Don Alfonso, but it certainly turned out as delicious as I remembered). 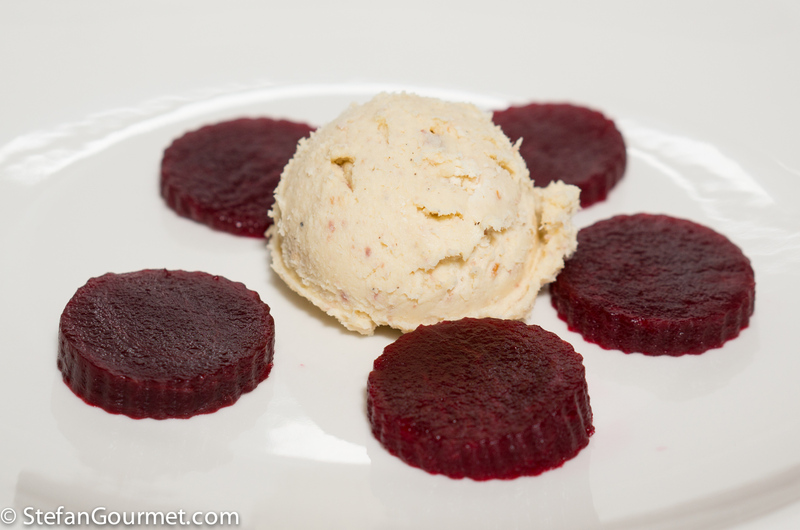 The creamy and smoky eel ice cream works very well with the earthy and crisp beets. If you don’t have an ice cream maker, you could even just skip that step and just chill it in the refrigerator. Even at refrigerator temperature, the eel ‘mousse’ is already quite solid and has a pleasing texture. This would be a great appetizer for your Christmas menu, as it is elegant, special, can be made in advance, and requires ingredients that can be purchased well in advance. Combine the chopped eel, heavy cream, egg yolks, skim milk powder, 1/2 teaspoon of salt, and freshly ground black pepper in a saucepan. Heat the mixture to 85C/185F over medium heat, while stirring constantly. Turn off the heat as soon as the temperature is reached. 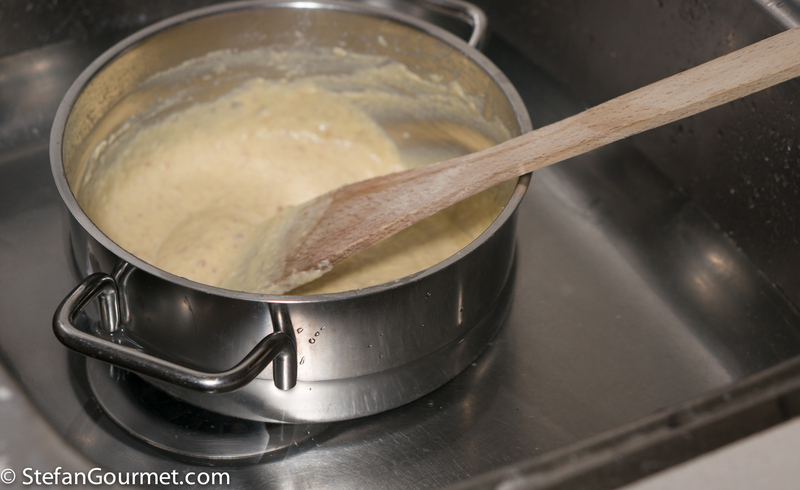 Quickly chill the mixture by putting the saucepan in cold water and stirring. Replace the water with cold water if needed. 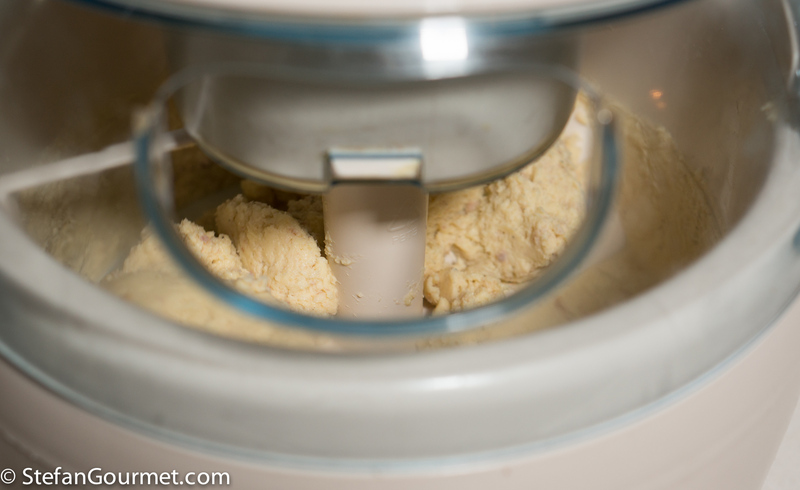 Churn the mixture in an ice cream maker if available, otherwise you can skip this step. 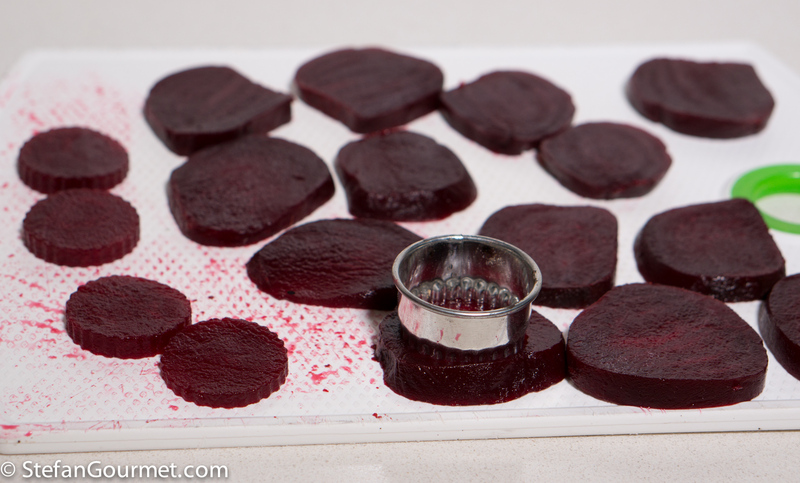 Slice the beets and then use a cookie cutter to make nice even slices. (Reserve the trimmings for another use.) Season the beets with a bit of salt. Serve a scoop of eel ice cream per person with the beet slices for garnish. This is very nice with a rose (pink) champagne. The bubbles clean the palate from the ice cream. 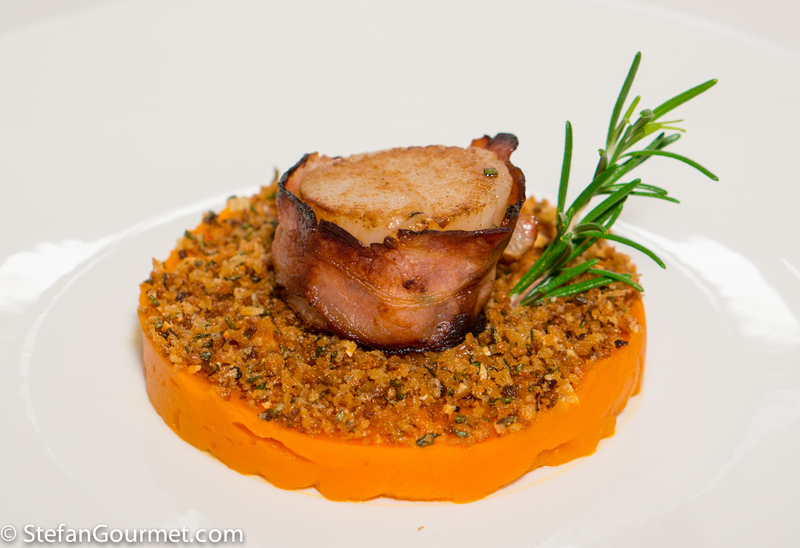 This bacon-wrapped scallop with pumpkin would be a great alternative appetizer for your christmas dinner, because it is delicious, looks great, and is quite easy to prepare. Only a few ingredients are needed to make a fantastic dish. Scallops and bacon are friends, so bacon-wrapped scallops are a classic. The trick is to cook them such that the bacon is slightly crispy without overcooking the scallop. This is achieved by precooking the bacon. Together they work well with pumpkin because both pumpkin and scallops are sweet. To add some crunch, breadcrumbs flavored with anchovies, garlic, and rosemary are added. Those flavors work well with both pumpkin and scallops. Next to pig’s blood pancakes smoked eel is probably my very, very most favourite thing to eat: but for breakfast on black bread with cottage cheese ! Ice cream? I just cannot see it but find the idea quite fascinating . . . and since beetroot also ranks amongst close favourites I just have to find experimentation time . . . invite a few Estonian-born friends to try and not say a word and watch their faces . . . These are the recipes I really like! Just try to be different. I already made once honey-mustard-dill ice cream to pair with home smoked salmon. You left out the rose. That taste intreges me. I still have a little bottle unopened somewhere in the back of my cupboard. 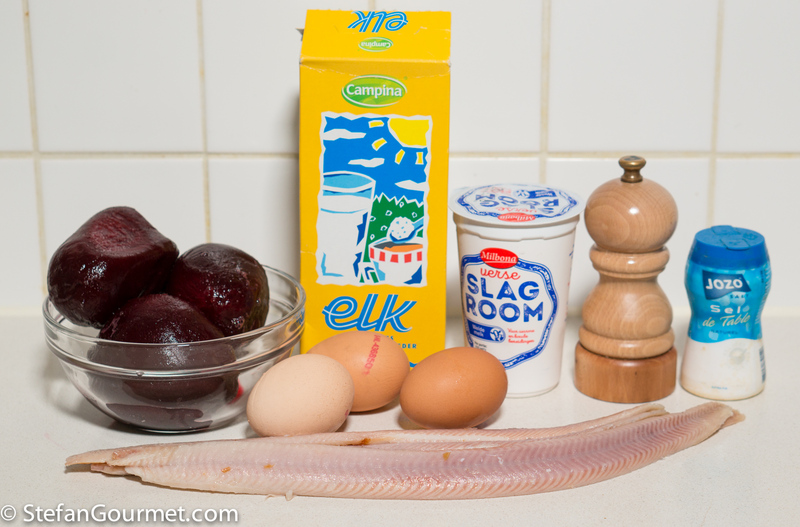 I think I’ll buy some eel and beetroot today and try to marinate the beetroot in the rose water. Let you know. By the way; wat is skimmed milk powder in het Nederlands en waar koop ik het? The rose petal pasta at Don Alfonso was very mild and I’m not sure I would have known it was roses if they hadn’t told me. The rose water is very powerful, so I would use a very small amount (like 1/4 teaspoon). Skim milk powder is “magere melkpoeder”. This is an interesting ingredient, because the Netherlands is one of the larger producers in the world, but it gets all exported because we have such good availability of fresh milk. I bought it at Hanos. It will be fine if you leave it out. You may be able to substitute with powdered milk for coffee. Or I could mail you some, as at Hanos you can only buy it in a large quantity that I won’t finish before the expiration date. For this eel ice cream I don’t think it is important to use, but for other ice creams with a higher water content (I.e. fruit) it can make quite a difference. Thank you for the offer to send some milk powder. If you think I can leave it out, I’ll give it a try without. I used to teaspoons rose water on 40 grams of chopped beetroot. I think it pairs very well and certainly will add to my Christmas dinner (and others to come) The Champagne is probably also a good idea, but didn’t try it. I’d like to know your opinion. Heavenly combination, but not sure what wine to connect. Or also a thick Champagne or Cava? Hi Frans, you can definitely leave out the milk powder. I think the Bernardus will be too powerful for the oysters, but an oaked Chardonnay from a cooler climate like Burgundy (unfortunately good Chablis is expensive and cheap Chablis is usually bad) or an aged Champagne or Cava is a good idea. For good value for money I would recommend a “Gran Reserva” Cava, that has been aged with the lees for at least 3 years. Regular champagne (15 months) or regular cava (9 months) is not rich (‘thick’) enough for the dish you are proposing. 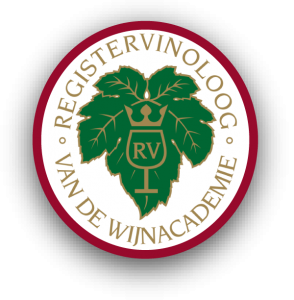 Aged champagne would also be great, but it much more expensive than Cava of the same quality. I marinated some small cubes of watermelon in the rose water, and mixed it with plain cubes of beetroot. Brought an extra bite to it all. Surrounded the eel ice scoop with the little watermelon/beetroot cubes. Some small cuts of rose petals on top and I’m ready for the Christmas dinner! I found the milk powder at AH, the same box ELK as on your picture! But I found the ice not really creamy.maybe I should really leave the powder out? Hi Frans, I just remembered I had not replied to this yet. I am surprised the ice cream was not creamy. 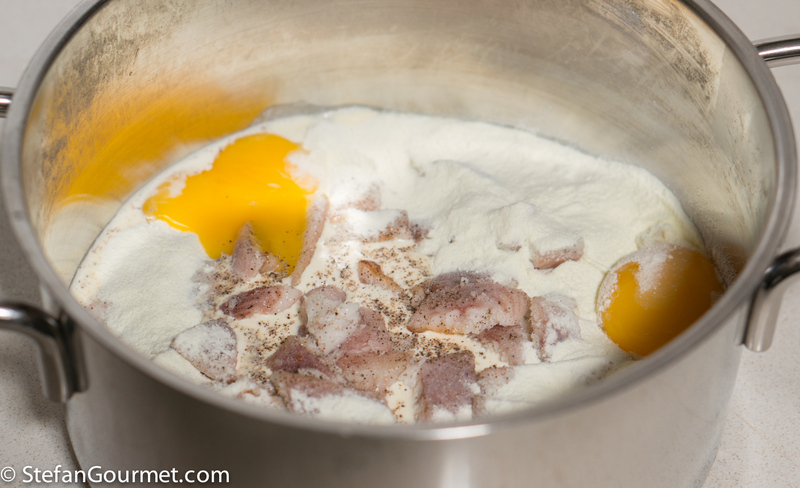 Assuming that you mixed the milk powder well (so there are no lumps), leaving out the milk powder will not help to make it creamier. The watermelon idea sounds nice. I added the milk powder straight into the mixture of all the other ingredients. Suppose I didn’t had to add some water or prepare in some way? What I noticed during the heating process that it becam quite fast a little too stiff, although I watched and controlled the temperature securely. Cooled it down as you described. I had XL sized eggs, maybe too much yolk? Then I put it my little ice machine, which is a refrigerated bowl with a rotating blade. After some minutes I wanted to move some ice from the blade, so took it out. In the meantime the ice had become that tight that the little motor couldn’t get through anymore. So maybe the mixture wasn’t stirred enough? Hi Frans, I have just checked the recipe to make sure, but the amounts are correct. 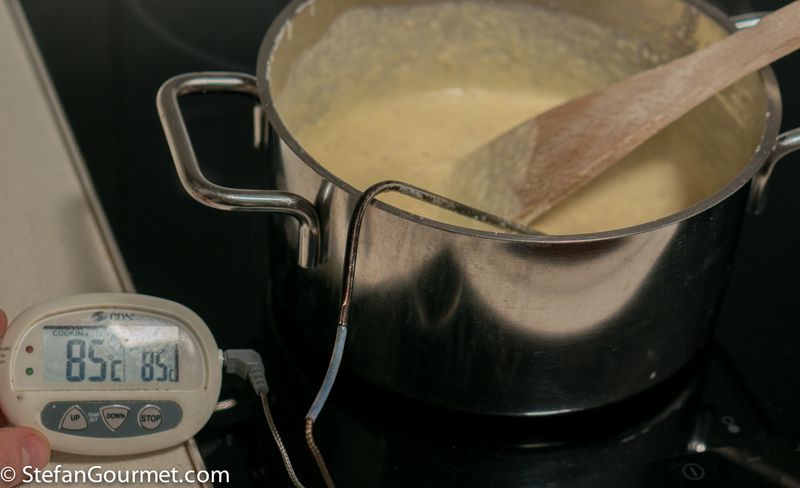 Before you start heating, the mixture should be fluid and heating will only thicken it a little. When I put the mixture in the refrigerator to chill, it did become very thick but not solid. The best I can think of is that the temperature did go up too fast? 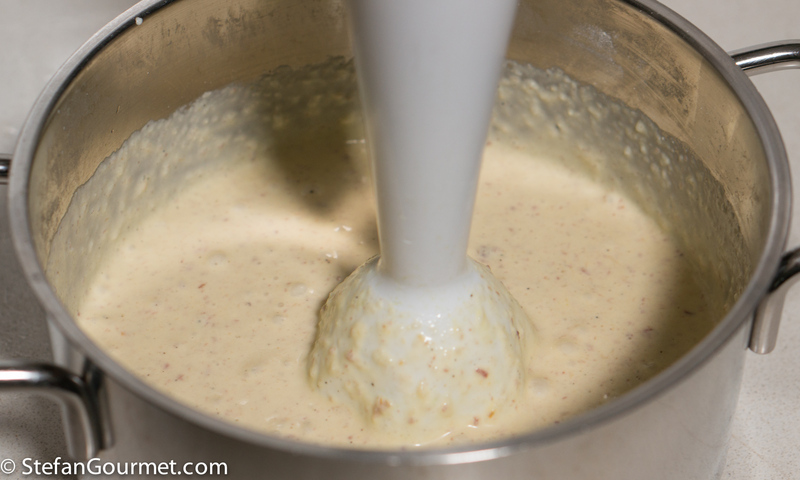 30 grams of milk powder in 250 ml of cream should not make it thick at all. Tried it for the second time, but more or less the same effect. I’m afraid it’s the freezer. In my little ice maker there’s a bowl which comes out of the freezer (there’s frozen liquid inside). In there the mixture is being stirred by the motor. There the trouble starts. Maybe is too cold in there? Also when I take it out of the freezer next day, leave it out for some 20 min., it stays too crumbled to make a nice and creamy scoop. But, it still is a great pleasure for the mouth! 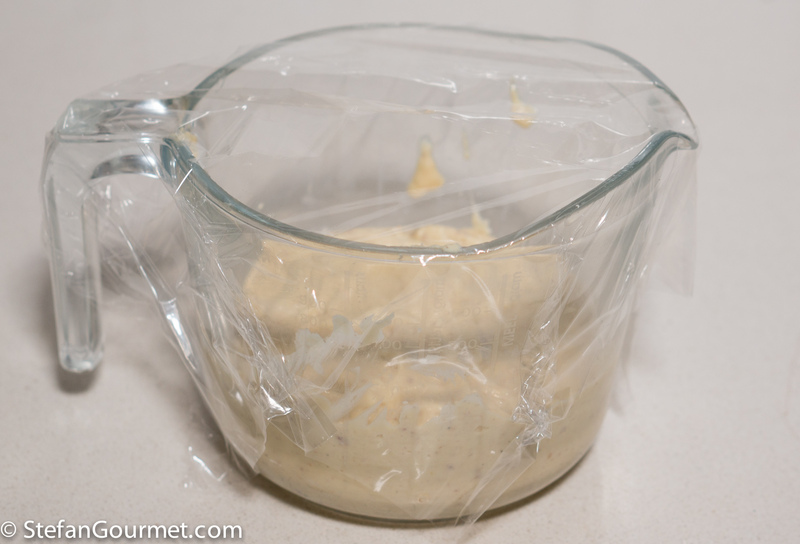 You could also not freeze it at all, just chill it, and serve it as eel mousse. The little ice maker may be so small that it freezes too quickly, but that problem should disappear when you allow the ice cream to melt.